Now isn’t he dapper?!! Love the glasses, tie and pocket square. I love this charmer of a man and I wouldn’t change a thing–even his gap toothed smile is irresistible! Thanks for this dapper looking gentleman. What a luxurious bow tie. You could certainly do worse, imo. Fun, but almost like a caricature. Costumey. He looks so happy, I wish he were my dad! What a fabulous, larger than life character! He makes me think of Groucho Marx with the glasses and the cigar! That bow tie is gorgeous too..
……………. and is that a monogram I see on his shirt? love the green Italia !!! Hope you’ll catch him again in one of your photos. My, my. The combination of colours is glorious. Those two different shades of green! His zest for life is even more appealing. What I love about this is the attention to detail. He obviously didn’t throw this on and forget about it. The tie, the little chain at his belt, the pocket handkerchief and the immaculate shirt are wonderful. 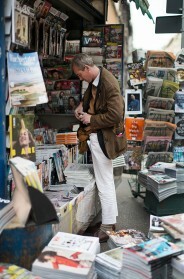 This with a beautiful rumpled linen suit. Amazing. Love everything about this guy. I want to drink Campari with him. They walk among us — the Fabulous Folk in every generation who understand the power of personal presentation as projected through a witty / creative / colorful / magical lens. Wonderful. If only everyone was such a perfect character. This is one of my all-time favourites!!!!!!!!!! So many wondrous details…and the charm of the gap between his front teeth..the edging of the jacket…can you even BEGIN to imagine his home. This actually just made my entire day. The whimsy, oh the whimsy! It’s just spectacular. 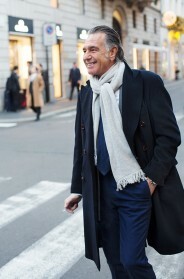 What a charming man and the humour on his face and let’s not forget that this is a good example of ‘Old Men’s Style’. The glasses and the bow tie together with the pocket square all in different types of green…delicious to see ! He is all sorts of amazing! Am loving the pocket kerchief – looks like a tulip! His attention to detail is so thorough, I suspect he even selected the belt because the raised edge mimics the trim of the jacket. 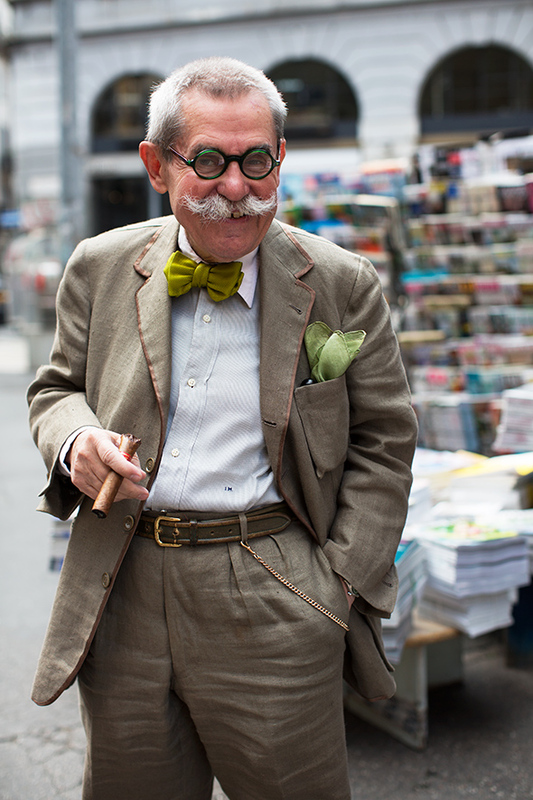 The three greens are tremendous as are the monogrammed shirt, the cigar, the chain, the mustache, the gap, and the smiling eyes. What an imp! This is true style. I wish all men that walked down the street had this personality ^.^ such a smile on my face now! ITALO from La Libera! Sweet man! I really feel some kind of love to him. What a lovely gentleman this is. Old Man Style very well matched with his naughty smile !! I see the Hobbits in the Shire are looking very natty these days. Such a golden pose with a golden smile. Today is the first day I have had off in a long time; I am lounging around drinking coffee and looking at your beautiful photos. I am falling in love with this blog all over again! You truly are amazing, Scott. A man my age supercute!